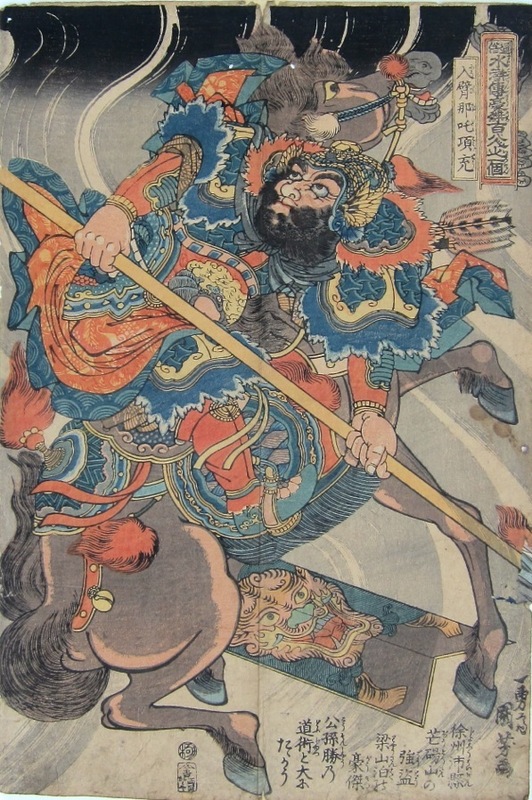 Utagawa Kuniyoshi (1797-1861) The 108 Heroes of the Popular Suikoden: Nyubina Dakoju on a Horse, 1827. Oban. 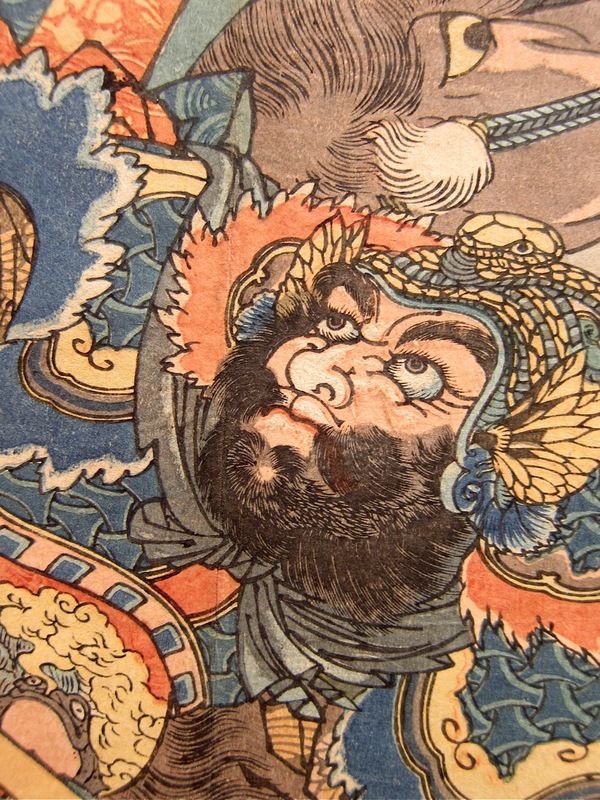 The series remains one of the most important series of Japanese woodblock prints ever made. Hiroshige’s 53 Stations of the Tokaido Road, for example, changed the way that the Japanese (and subsequently, artists in the west) looked at the landscape and represented their journey through it. Kuniyoshi’s Suikoden did the same job for Japanese representations of heroism, and notably, the individual hero; not to say the countless numbers of full body tattoos that have been inspired by the designs themselves and the designs inked on the skins of the individual characters. The series established him as one of the handful of pre-eminent artists of the nineteenth century; it was in every sense, a ground breaking body of work and one of those innovations that changed the course of art. The series represents individual figures from stories of the semi-historical Chinese novel, Suikoden (Shuihu zhuan in Chinese). The narrative tells of the adventures of a band of 108 rebels who sought refuge in the margins of Liangshan Marsh. These rebel warriors sought to protect the poor and downtrodden, very much like Robin Hood’s band of outcasts in medieval England. They were eventually to win both favour and pardon for heroically defending the country from invasion. As with so much ukiyo-e, the story itself is apocryphal, the characters are invented wholly or else dramatically embroidered and it is the 'idea' of the series and its astonishing and inventive power that carries Kuniyoshi’s vision. Japan was, even as early as the 1820’s, aware that it was living on borrowed time. The hermetic, enclosed, feudal culture of the centuries old shogunate was decadent and crumbling. The Japanese people were well aware of the world beyond their shores and the ruling samurai class were a dilettante excess that the new merchant class were openly resentful of. This series of apparently innocuous fantasy portraits was an important reminder of past glories and of the importance of personal honour. As with all assessments of art history, it is easy to package innovation as an isolated incidence of individual genius. There were in fact many precedents for the single, full colour warrior portrait. Hokusai had made single colour prints of the same subject in the 1820’s and Kuniyoshi’s teacher Toyokuni I had produced similar pieces in the 1810’s. But there is no denying that Kuniyoshi brought a new vision, a new vitality to these efforts and is justly celebrated for so doing. This marvellous print depicts the warrior Nyubina Dakoju on horseback. His Chinese name in the stories is Xiang Chong, he ranks 64th of the 108 Liangshan heroes and 28th of the 72 Earthly Fiends. He wears a steel helmet and carries a shield with a beast's head engraved on it. He wields an iron spear and 24 flying daggers for hurling at enemies. He excels in martial arts and can hit a target a hundred steps away accurately with his daggers. He also walks at a lightning speed. He is nicknamed "Eight-armed Nezha" after the warrior deity. Xiang Chong is a close friend of Fan Rui and Li Gun. The three bandit chiefs get into conflict with the outlaws at Liangshan Marsh after announcing that they will conquer Liangshan one day. Liangshan's Shi Jin leads a vanguard force to attack Mount Mangdang, but loses the first battle against Fan Rui's forces, and manages to escape only when Liangshan reinforcements arrive. Xiang Chong becomes one of the leaders of the Liangshan infantry after the Grand Assembly of the 108 Stars of Destiny. He follows the heroes on their campaigns against the Liao invaders and rebel forces after they have been granted amnesty by Emperor Huizong. During the campaign against the rebel leader Fang La, Xiang Chong and Li Gun are assigned to attack Muzhou, where they face the enemy general Zheng Biao in battle. Zheng Biao uses his lasso to trip Xiang Chong, who is killed by Zheng's men after he is down. This is a fine print, S2.48 in Robinson. Colour is fine, impression is very fine of an early printing, and condition is fine excepting the usual trimming, (not excessive on this sheet), and some wear. A copy of this print is at the British Museum.